Baobab seed oil is a highly moisturizing and skin smoothing therapeutic. It is rich in fatty acids, particularly linoleic [omega-6] and oleic [omega-9] acids. These fatty acids help restore the barrier function of skin, especially thin, aged skin. Baobab seed oil also contains healthy vitamins A, D, E, and F that rejuvenate skin. In addition to moisturizing, baobab seed oil aids in wound healing, collagen production, sun damage protection and repair, and can prevent wrinkles. It has anti-microbial, anti-inflammatory, and anti-oxidant properties. Overall, baobab seed oil can improve the softness and strength of all skin types, even irritated skin. The baobab tree, Adansonia digitata, is found in dry regions of South Africa and Namibia . It is considered the largest succulent plant in the world . The name “baobab” comes from a word meaning “fruit with many seeds” . When the seeds are pressed, 10-12% oil can be extracted and used for cosmetic purposes . Traditionally, the seed oil is used as a moisturizing oil . Baobab seed oil is highly absorptive and non-irritating . It is suitable for all skin types. The oil is very stable and good for use as a massage or carrier oil . Also, the consistency of baobab seed oil makes it good for soap making 1]. The oil contains high amounts of fatty acids, including essential fatty acids [omega 3 and 6] that must be supplemented as the body cannot make them. Fatty acids have many therapeutic properties. They are highly emollient, meaning they soften the skin and protect it against dryness . Baobab seed oil has equal amounts of saturated, polyunsaturated, and monounsaturated fatty acids . Saturated fatty acids have no double bonds in their chemical structures, while polyunsaturated and monounsaturated have varying amounts of double bonds. 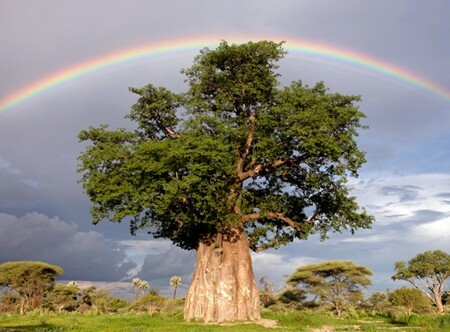 The most abundant fatty acids in baobab seed oil are oleic acid and linoleic acid. Linoleic acid, an omega-6 fatty acid, is the most common fatty acid in cosmetic products . It is known to moisturize, heal sunburn, and treat acne . High amounts of oleic acid, an omeg-9 fatty acid, have been connected to anti-oxidant activity . Additionally, oleic acid is known to enhance skin penetration and suppress inflammation . It may also help reduce oil production in pores . In addition to fatty acids, baobab seed oil contains healthy vitamins A, D, E, and F . Vitamins A and F are known to rejuvenate the skin and renew cell membranes [5, 9]. Vitamin E is a known anti-oxidant and has anti-aging effects . Baobab seed oil protects and moisturizes the skin. It is helpful for dry, chapped skin because it restores skin barrier function [9, 13]. It improves the cross-talk between different layers of the skin and balances moisture between them . It is especially helpful for restoring barrier function in thin, aged skin [5, 6, 7]. Baobab seed oil is thought to increase production of anchoring fibrils, a type of collagen that aids in structural soundness of the skin . Additionally, baobab seed oil protects the skin against premature ageing and wrinkles  and prevents stretch marks in pregnancy . Due to its excellent moisturizing properties, it is useful for the treatment of eczema and psoriasis [2, 5, 9]. Research shows this oil is useful as an anti-microbial to fight skin infections. Baobab seed oil was shown to be anti-fungal against a panel of fungi and also inhibits or kills various bacterial species [6, 7]. It is anti-inflammatory—a paste made of seeds is traditionally used to help treat inflamed, swollen gums . Baobab seed oil has also been shown to aid in wound and burn healing [5, 11]. It can help prevent and treat sunburn and photo-aging, chronic skin damage due to excessive sun exposure . Baobab seed oil can also have analgesic [pain-relieving] effects. The oil alleviates burn pain and regenerates skin tissue after damage, improving elasticity [5, 9]. Α (ALPHA) TOCOPHEROL 8,00 mg/Kg. Γ (GAMMA) TOCOPHEROL 616,00 mg/Kg. Δ (DELTA) TOCOPHEROL 54,00 mg/Kg. E. De Caluwé, K. Halamová, and P. Van Damme, “Adansonia digitata L. – A review of traditional uses, phytochemistry and pharmacology,” Afrika Focus, vol. 23, no. 1, pp. 11-51, 2010. S.A. Desantis, “Skin care and Restoration Composition and Methods,” United States Patent Application Publication, December 2013. A.C. Dweck, “The role of natural ingredients in anti-ageing of the skin,”¬ Australian Society of Cosmetic Chemists Annual Congress, transcript, Hamilton Island, 2003. P. Engels, “Cosmetic Preparations with an Additive from the Baobab Tree,” United States Patent Application, pp. 1-28, December 2009. G.P.P. Kamatou, I. Vermaak, and A.M. Viljoen, “An updated review of Adansonia digitata: A commercially important African tree,” South African Journal of Botany, vol. 77, issue 4, pp. 908– 919, October 2011. A. Samie and T. Nefefe, “Antifungal activities of essential oils from Southern African medicinal plants against five Fusarium species,” Journal of Medicinal Plants Research, vol. 6, issue 3, pp. 465-478, January 2012. A. Samie, T. Nefefe, M. Gundidza, V. Mmbengwa, M. Magwa, and M. S. Mtshali, “Antimicrobial activities and time kill profiles of five essential oils from Southern Africa against selected bacterial and fungal organisms,” African Journal of Pharmacy and Pharmacology, Vol. 6, issue 44, pp. 3086-3095, November 2012. Baobab, Adansonia digitata: Field Manual for Extension Workers and Farmers,” Southampton Centre for Underutilised Crops, Practical Manual no. 4, 2006. I. Vermaak, G.P.P. Kamatou, B. Komane-Mofokeng, A.M. Viljoen, and K. Beckett, “African seed oils of commercial importance — Cosmetic applications,” South African Journal of Botany, vol. 77, pp.920-933, 2011. S. Wren and A. Stucki, “Organic essential oils, indigenous cold pressed oils, herbs and spices in sub- Saharan Africa,” The International Journal of Aromatherapy, vol. 13, no. 2, 2003. N. Zimba, S. Wren, and A. Stucki, “Three major tree nut oils of southern central Africa: Their uses and future as commercial base oils,” The International Journal of Aromatherapy, vol. 15, pp. 177- 182, 2005.